I’ve experienced Institute for Crazy Dancing’s Lifeboat twice now, once in Cross Flatts Park, Beeston, Leeds in April this year, and the second time in St Ann’s Square, Manchester at Hazard in July. 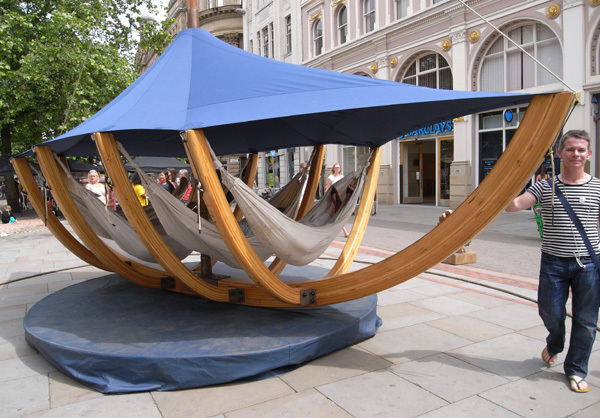 The lifeboat itself is a carefully crafted wooden boat-like structure, with a blue canvas awning, from which hang 4 hammocks. One or two of the Lifeboat crew push the boat around for 5 minutes or so, whilst the hammocks gently swing from side to side. People queue up to take part all day long. They declare the experience to be relaxing and contemplative. One reason Lifeboat matters is that it allows people who dare to ride in it to experience the possibility of being in a world that is otherwise. It shows us that if we can make this little world inside, we probably are making the bigger world as well. It opens space for imagining that it can and should be different. It is possible to be kind and gentle and to take time to get your bearings, in the company of others who are doing the same, and thus feeling your position in the world from a continuously changing point of view. Lifeboat seems to be about taking time out, not wasting time: allowing the course of the day to be interrupted by spending time reflecting differently. 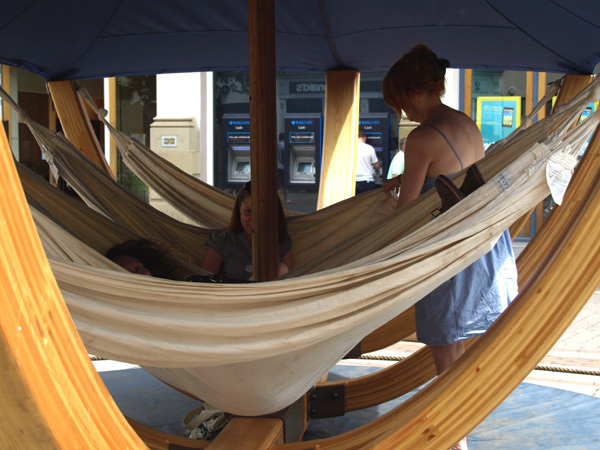 Here in St Ann’s Square the experience offered a new perspective on a crowded, busy shopping street. It disrupted the square as a commercial space – someone asked ‘Is it free?’ It also offers something highly unusual: a space to reflect individually yet communally in public.